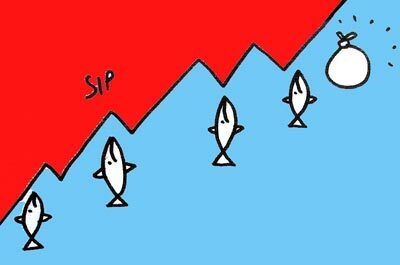 Rediff.com » Business » Stay invested in SIPs, folks! Stay invested in SIPs, folks! Experts tell Chandan Kishore Kant that investors should stay patient and stay invested in mutual funds. In bad news for orthodox financial counsellors, the returns made by investors opting for a Systematic Investment Plan (SIP) on popular equity schemes in mutual funds since May 2014 have failed to beat that given by basic bank recurring deposits (RDs). Most top MF equity schemes have given an annualised return of around 8%. In comparison, bank RDs were offering 8.5% during the first half of 2014. An SIP is one where one invests the same amount periodically -- weekly, monthly, quarterly -- instead of lump sums every now and then, and regardless of how the scrip or market is doing. This, goes the received wisdom, is the best and most sensible way to invest. Some of the popular schemes are ICICI Prudential Balanced Advantage Fund, HDFC Equity, Birla Sun Life Frontline Equity, HDFC Top 200, ICICI Prudential Focused Bluechip and Axis Long Term Equity. Barring HDFC Mid-Cap Opportunities and ICICI Prudential Balanced Advantage Fund, no other scheme in the top 10 list could offer an SIP annual return of more than 8%. These schemes account for nearly a fourth of all equity assets under management of the sector. HDFC Equity Fund and HDFC Top 200, for instance, have given an SIP (annual) return of 4.9% and 5% since May 2014. A monthly SIP of Rs 1,000 starting May 2014 would have resulted in a principal investment of Rs 32,000 till December 2016. The value of this investment is currently Rs 34,146 in the case of HDFC Equity and Rs 34,201 with HDFC Top 200. Reliance Equity Opportunities Fund has offered an SIP annual return of a mere 0.29% to investors, turning the investment of Rs 32,000 into no more than Rs 32,126 since the Narendra Modi government came to power. One should, however, note that investment in equity MFs through the SIP route and banks' RDs are not strictly comparable; they operate in different asset classes. RDs offer guaranteed returns, but investors need to pay tax on interest income (depending on the tax bracket). Equity funds are far riskier, but can outpace the RDs' returns by a wide margin in the long term. And the gains are tax-free. "It's not best to compare the returns of equity schemes in less than three years," says Dhirendra Kumar, chief executive officer, Value Research, a tracker of MFs. "Given the market condition and with the wait for recovery still on, a majority of equity schemes have done reasonably well. "Further, a gain of 8% in RDs and one of 6% in equity schemes are the same, as the income generated from RDs is taxable." One chief investment officer, who spoke on condition of anonymity, told Business Standard, "The past two years have been tough for generating better returns. The fundamentals are yet to improve. We had estimated the recovery to start by mid-2015, but this did not happen." "At this point, my advice to investors is to stay patient and stay invested. Investment in banks' products is not advisable at this stage, as yields will further go down." Over the past 30 months, the SIP trend has surged and there are now over 10 million of these accounts. The average investment size of an SIP is about Rs 3,500.